Odawara is the gateway to the one of most well known Onsen resort, Hakone. If you take JR trains, you have to change the trains to Hakone at this station, Odawara. Odawara station is not a mega terminal station. But there is JR Tokaido line, Shinkansen and Odakyu/Hakone Tozan Railway. It may make you be confused. In this post, I show you many images of all transfer exit, ticket gates and platforms. You will find how to transfer the train at this station, Odawara. You also can get a map at JR East official site (English). At Odawara station, there are four railway companies, Izu-Hakone Railway Daiyuzan line, JR Tokaido line, Odakyu / Hakone Tozan Railway, and JR Tokaido Shinkansen. Most of you do not need to take Izu-Hakone Railway Daiyuzan line. This railway actually does not go either Hakone and Izu. I explain for other three railways in this post because Izu-Hakone Railway is a commute line for locals. * Strictly speaking, Odakyu Railway and Hakone Tozan Railway are the different railway companies. However Odakyu Railway is the parent company of Hakone Tozan Railway. And the segment between Odawara and Hakone-Yumoto belongs to Hakone Tozan Raliway. However all trains are operated by Odakyu Railway’s fleets. So you can think Odakyu and Hakone Tozan Railway are the same company. 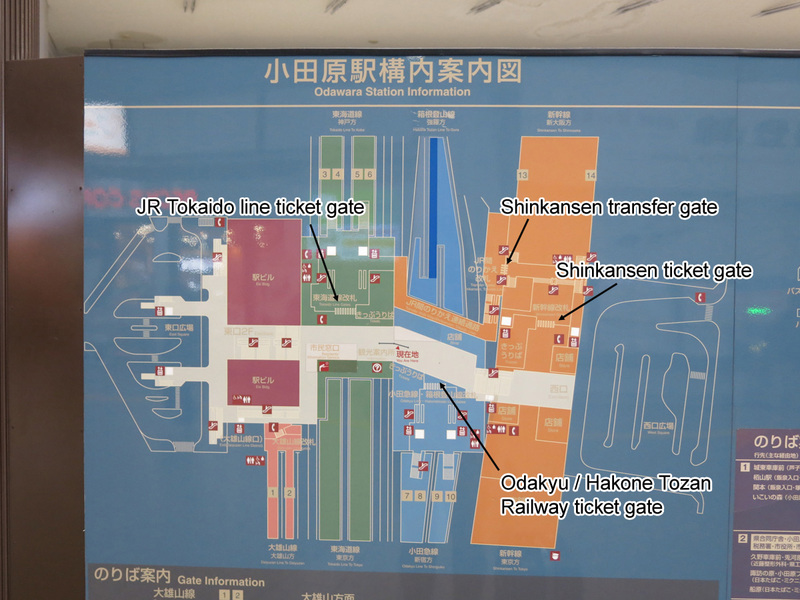 On the ground floor, there are Tokaido line platforms, Odakyu / Hakone Tozan Railway platforms and Shinkansen exit/ticket gate. Both JR Tokaido line and Odakyu exits/ticket gates are located at the overpass. All exits/ticket gates are connected the overpass. You can find the overpass to be shown by white shade in the station map above. Only Shinkansen’s platform is located at overhead. As you saw the map above, all railways have one ticket gate/exit. And there is Shinkansen transfer gate between Shinkansen and JR Tokaido line. If you transfer between JR trains and Shinkansen, you don’t need to exit. Just go through Shinkansen transfer gate. Because you can use one same base fare ticket for both JR trains and Shinkansen. However if you go to Hakone, you have to get on Odakyu/Hakone Tozan Railway. In this case, you have to exit and then enter Odakyu platform. Now I explain you how to transfer at Odawara station. I show you several photos and explain step by step. It is not far and very easy to transfer. First of all, when you get off Shinkansen just follow the sign to exit and go down the stairs, escalators or elevators. You will see Shinkansen exit. When you exit Shinkansen gate, you will see the concourse. You will find the stairs and escalators on your right hand side. Proceed to upstairs and you will find Odakyu and Hakone Tozan Railway’s ticket gate right after you get upstairs. Go upstairs from the platform and you will find ticket gate/eixt. Proceed to the left on the concourse. And you will get Odakyu / Hakone Tozan Railway’s ticket gate soon. Some of you want to purchase the Odakyu Railway’s ticket or Hakone Free Pass. There is Odakyu Sightseeing Service Center just beside Odakyu Railway’s ticket gate. You can purchase these tickets/passes. You can book Odakyu’s limited express “Romancecar” here. After you go through ticket gate, you will the signage above. And also there are lots of sign of “To Hakone” and “Hakone Tozan Railway”. All you have to do is just following these sign. You will find the train that goes to Hakone-Yumoto. If you take Romancecar from Odakyu Shinjuku, the train goes to Hakone-Yumoto directly. You don’t need to transfer at Odawara. But if you take local train, you have to transfer to Hakone-Yumoto. There is no direct trains from Shinjuku to Hakone-Yumoto other than Romancecar. In this case, you don’t need to exit. You may proceed Shinkansen transfer gate. And you will go through connection path and get in the station of Tokaido / Shonan-Shijuku line station. It’s shown by Orange shade in the station map above. If you just transfer the trains, you can make it in 10 minutes. However if you need to purchase a ticket or pass, you have to add 10 more minutes at least. In the peak season, Odakyu Sightseeing Service Center is busy. It may take 15 minutes there. So give yourself plenty of time. Can we go to Kyoto by Shinkansen from odawara station? May I know the timetable to Kyoto? Hello! Is it possible to store your luggage at Odawara Station while you visit Hakone? I am thinking of a rather large backpack and suitcase, so a locker will probably be too small. Thank you very much. There is luggage storage service at the underground shopping area “HaRuNe Odawara”. It is located under Odawara station. Only coin lockers are available in the station. Hi there, for the train ride on the Hakone Tozan line between hakone-yumoto station & Odawara station, can I pre-buy/reserve tickets? I am not planning to get the pass as I will only be staying locally around hakone-yumoto station. If you take a local train for this segment, you cannot reserve and pre-buy it. You just go to the station and buy a ticket at the vending machine just before taking train. Previous Previous post: Utsunomiya station guide. How to transfer to Nikko train. Next Next post: Tokaido Shinkansen image gallery. Check the interior and accommodations.